How Does "Turning Edges Into Nodes" Relate to "Observing The Observer"
A frame is a lens through which we see the world. We&apos;re always framing things, but very rarely are we aware of those frames. In this Mental Model Monday, I go over "Subject-Object Shifts", or the process by which we become aware of the frames through which we see things. I also give two practical ways to quickly make subject-object shifts in your own life. Hi, this is Matt, and this is Mental Model Monday number 26. Today I wanted to talk about subject-object shifts. These are incredibly important in the development of people and how they think. If you can learn to make subject-object shifts faster, then you can exponentially increase your rate of development and growth and understanding in a new field. The idea behind a subject-object shift is that what was once something that you were subject to, something that was unconscious to you, something that you saw through, now becomes object to you, something that you can look at, something that you can play with, something that is not the way the world is but is just a way to look at the world. One way to look at them is that they are a way to examine unconscious assumptions. That&apos;s sort of a fake and not quite true model of what subject-object shifts are, is they are a way examine assumptions which at one point were unexaminable to you. 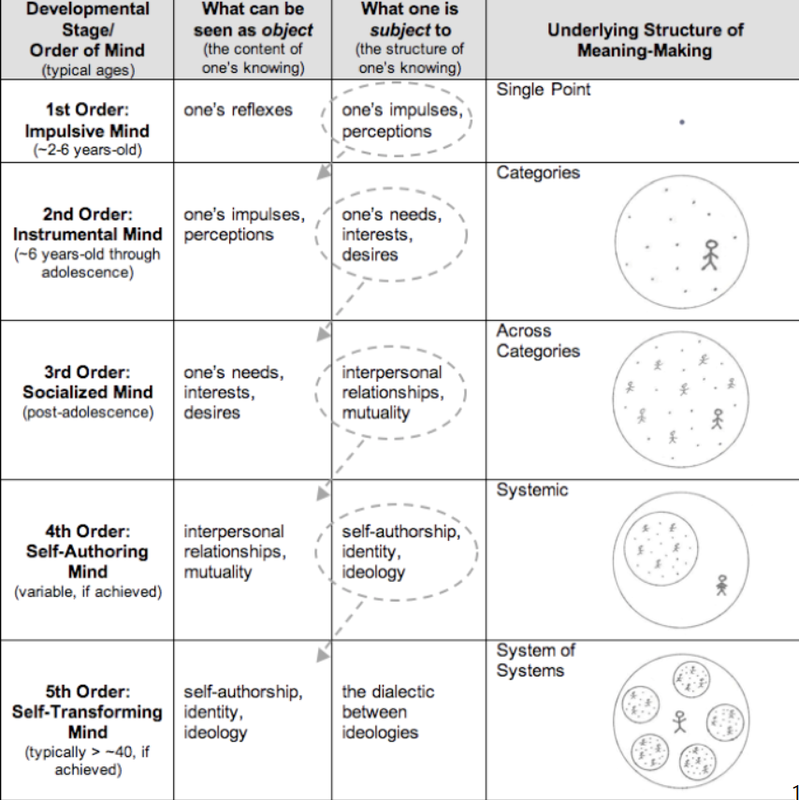 An example of where subject-object shifts happen are in Kegan&apos;s developmental stages. This is one model of how adults develop. In Kegan&apos;s developmental stages, he&apos;s the one who coined the term subject-object shift, I believe. In Kegan&apos;s developmental stages, at each stage the thing that you originally saw as the world becomes a part of the world. At stage two, your impulses and perceptions, you can now see they&apos;re not me. They&apos;re part of me but my needs, interests, and desires are me. That&apos;s who is am, that&apos;s what I am. That&apos;s all there is. Whereas in stage three you see, oh, my needs, interests, and desires are not all of my. They&apos;re not all of the things that matter. I can see beyond that. Those are just individual things that I can play with. My whole world is now relationships and mutuality and how I interact with others, and the relations between people, and my friend group. Then the relationships between people and my friend group now become just a thing I see. I&apos;m not defined by that. I have my own values system, my own identity, my own mission. That&apos;s what I&apos;m seeing, and all my relationships and my mutual connections are in relationship to that. It goes on to the fifth order, where even my values system I now see is just one of many values systems. What I&apos;m seeing is the dialectic between different ideologies and how they relate, and the interrelationships between systems. That&apos;s a series of subject-object shifts that happen well into one&apos;s 40s, if at all, to get all the way to fifth order. But you can see how the ability to make these shifts faster and the ability to understand what a subject-object shift even is, it can be really powerful in your own growth and development. What I&apos;m going to do is I&apos;m going to go over a few different ways to look at some of those object shifts. I&apos;m going to talk about how they are actually the same way of looking at subject-object shifts and how they relate to concepts like enlightenment. The first thing I want to talk about is turning edges into nodes, which you can also go back in Mental Model Monday number 13, and that also goes into turning edges into nodes, but I&apos;m going to real quickly just rehash this concept. In a concept map, which is this right here, you have nodes, which are these square boxes. Then you have edges, which are the arrows and the words that connect the square boxes, so edges and nodes. One way to look at a concept map is that all of the squares, all of the nodes, are things that are objects in your ontology. They are things that you can look at, whereas all of the edges, the arrows and the words on them, are subjects, are things that you&apos;re looking through. They are assumptions about the world that you have. One way to shift from subject to object is to take one of these edges and turn them into a node with two new edges connecting two concepts. An example of this is if you have "pine is a tree." Your original concept map is a way you view the world that you don&apos;t even know that you&apos;re doing it. However, if you try to turn this "is a" into a node, what you realize is that what you really mean ... what you&apos;re really subject to, what the assumption you have here, is the idea of woody secondary growth. When you turn this into a node, what you realize the object is pine has woody secondary growth and is therefore classified as a tree. If you didn&apos;t realize that that&apos;s what was making you classify trees, you wouldn&apos;t be able to classify trees and different ways and new ways, and look at things differently. Again, the thing you were viewing through at one point, this "is a," is now something you can look at. You can see that the assumption you&apos;re actually [inaudible 00:07:30] there is that woody secondary growth is a way to classify trees. Just like Kegan&apos;s models, now that you know that this "is a" is just one way to classify trees, you can look at other ways to classify trees, whereas this "is a" prevented you from doing so. That&apos;s one way to have a subject-object shift, is to map out your ontology using edges and nodes, and then spend some time turning those edges into nodes. Now I&apos;m going to go over another way to have subject-object shifts. At first it&apos;s going to seem completely unrelated to the previous thing, but don&apos;t worry. I will show how these relate eventually. This is the idea of observing the observer. One way to think of yourself is a series of parts that are observing each other. You can represent these parts in three different ways. First, you can have some image for them. This is the glowing thing in my chest, or you just have some abstract thought. This is like a hammer. This is the hammer part of me. You&apos;re visualizing them. You can represent them auditorily. This is the voice that talks to me in this tone. This is my negative voice. This is how I talk to myself. You can also represent them kinesthetically. This is that rough feeling in my chest. This is that nice warm feeling I get when XYZ happens. The parts of yourself you represent visually, auditorily, and kinesthetically. Oftentimes we are subject to these parts. I am the voice in my head. I am this feeling of happiness or I am this feeling of warmth. I am the hero, the hero I&apos;m visualizing. Now how do you turn these parts that you&apos;re a subject to into parts that are objects for you to view? The Wholeness Process, by Connirae Andreas, has a way to do this. Here&apos;s how you do it. You take one of those voices, one of those images, one of those kinesthetic feelings that are located somewhere in your body, and you say, "I am aware of this tight feeling in my chest. I am aware of the voice that I&apos;m talking to myself with." First you just say the sentence, "I am aware of this part." Now here comes the tricky part. You ask yourself, where is the I that is aware of that thing? The I that I was looking through, where is it? That would be kinesthetically. Where is it in my body? You can also ask, when you say, "I am aware of this voice in my head," "Where&apos;s the voice that&apos;s saying that?" You can also ask, "When I see myself as a XYZ, where is the eye that sees the other eye?" You&apos;re trying to observe the observer and say, "Where is the eye?" At first this seems like a weird question, but if you just answer the question immediately, you&apos;ll come up with an answer, and it won&apos;t be this eye is looking at itself. There&apos;ll be another observer observing the thing. You&apos;ve now stepped out of this thing you are subject to and you are viewing it as an object. Interesting thing here, the thing you stepped out of, you didn&apos;t step out of all observers. You&apos;re now in another observer using this tool. But, again, you&apos;ve made this subject-object shift, so play around with that. I am aware of this feeling. I see this feeling. I hear this voice. Where is the eye that is here and where is the eye that is seeing? Where is the I that is aware? You can now view that I from a different observational point. One way to think about enlightenment is when everything is object. You are no longer subject to any observer. You are viewing everything as object. When you view everything as object, in a weird way, everything becomes subject. This is the idea of oneness. I am one with everything. When I can view everything objectively, I also am viewing as everything. Therefore, I feel at one with everything. This is the idea of enlightenment, is instead of stepping up one level observer, one level observer, one level observer, I&apos;m stepping out of observers altogether, and therefore everything becomes an observer and everything becomes the observed. Interesting way to go about this. These are two practical ways right now that you can make a Subject-Object Shift. One is you can try to observe the observer by using this "I am aware" sentence and asking yourself where is the I. Two, you can turn your ontology into a concept map. You can turn the edges of the concept map into nodes. Now the question is, these seem like two totally different things. How do you really understand them as one idea of subject-object shifts? One way to do this is to vusalize yourself first person on a node INSIDE your concept map and you are looking at another node, through the lens of that node&apos;s edge. Now the edge in that node is your beliefs about that node&apos;s relation to your current node. Before you did this visualization, you might not even have notice that each node has it&apos;s own observer, viewing it&apos;s relation to other nodes. Without consiously being aware of the multitude of observers that exist within a concept map, your ontology becomes "just the way things are". However, when you notice the observer, you can begin to question their observations. This, as you may notice, is the same thing as becoming aware of the I, and then examining its&apos; beliefs. This is how you tie together this idea of turning edges into nodes with observing the observer. You figure out that the observer is the thing that is looking from each node to the next one, and the edge is the unconscious beliefs that that observer has that you can make conscious. I hope you enjoyed that quick overview of subject-object shifts and how to have them. Please let me know if this is useful to you. Please let me know what was unclear. Please let me know if there&apos;s anything in here that you&apos;d like me to do a future Mental Model Monday on. Thanks for watching guys, and I&apos;ll catch you soon.